We are a home based business located in beautiful Vancouver, British Columbia, Canada. We are enthusiastic about nature, wildlife, bonsai art and gardening, tenderly caring for a large variety of plants, focusing on scented-leaf ones. 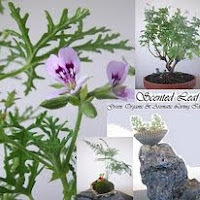 We like to promote our "edible, fragrant, very useful, showy, flowering, drought resistant, little care and very forgiving ..." scented pelargoniums / geraniums and our bonsai and saikei / miniature gardens. Shop on our eBay Store or Etsy Store.